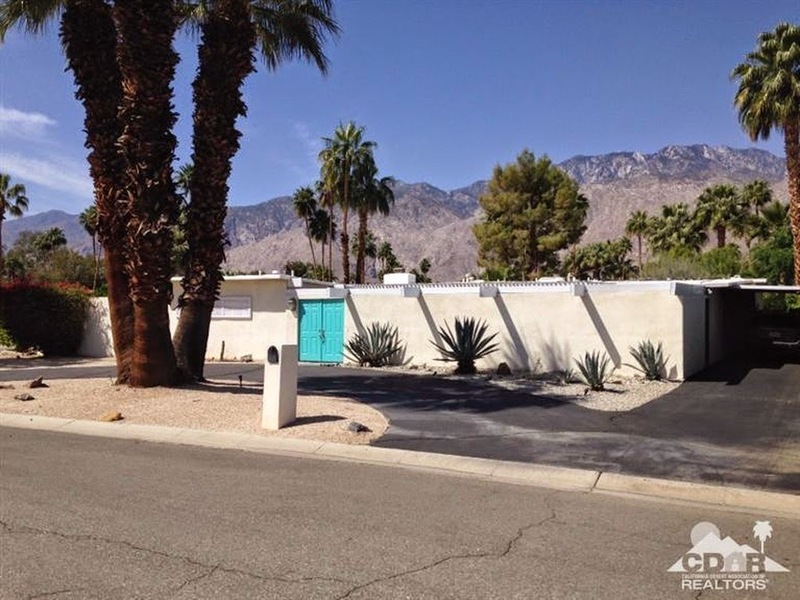 Up for grabs is this 1958 Palmer & Krisel-designed home in Palm Springs’ Sunmor neighborhood. It’s a four bedroom, three bathroom 1,944 square-foot home on a 9,500 square-foot lot with an asking price of $630,000. Situated on a small cul-de-sac, this property features an enclosed atrium, private backyard and low maintenance front yard with large wrap around driveway. The carport has been enclosed on this property, creating a private guest retreat but eliminating covered parking options. 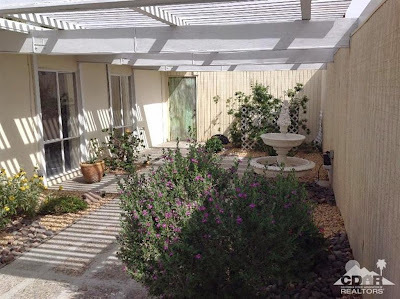 The entry courtyard features a bright blue double raised panel door that leads to a shaded and quiet retreat, finished with exposed aggregate walkways and a small fountain. The entry opens up into the main living and dining area which features large walls of glass which open out to the backyard. The living room features unpainted vaulted beamed ceilings and unfinished grey block fireplace. The home shows dark, partly due to the ceilings, but mainly as a result of the dark floors, the fact that nearly all the blinds are drawn in the photos, and the large-scaled furniture. The bathrooms aren’t totally original, nor are they very current, almost stuck in a time period that doesn’t quite fit the home. The bedrooms show much like the living room, fairly dark and not as light and bright as these homes are capable of. The backyard features a great view of Mt. 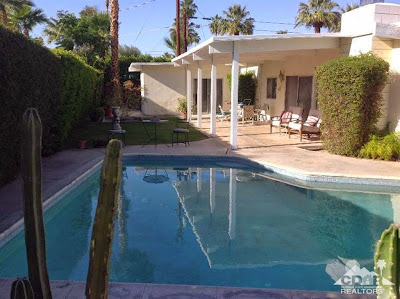 San Jacinto, a covered patio and an in ground pool. Mature landscaping abounds giving the yard a serene, private retreat feel. 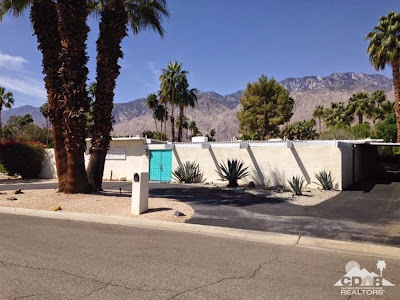 The current state of the home doesn’t show off the great midcentury modern lines of the home, but it’s definitely been well maintained and cared for. 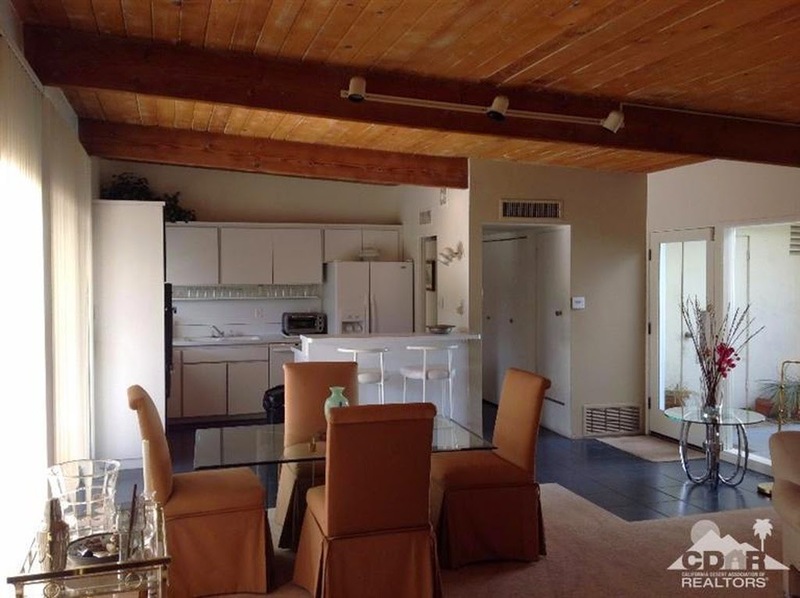 This is a great property with loads of potential to restore back to its mid-mod origins.